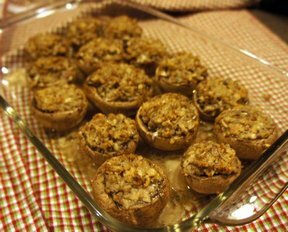 An elegant and simple appetizer that you will want to make over and over again. 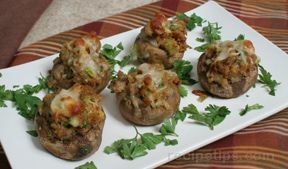 There's just something about a tender mushroom stuffed with a cheese and garlic. Delicious. Preheat the oven to 400Â°. Grease a baking pan large enough to hold the mushrooms in a single layer. Wash the mushrooms with a damp towel and pat dry. Snap off the stems and set the stems aside. Arrange the mushroom caps upside down in the prepared pan. Trim off the ends of the stems. Chop the stems and place them in a bowl. Add the bread crumbs, cheese, garlic, parsley, salt and pepper to taste. Stir in the oil. Spoon the crumb mixture into the mushroom caps. 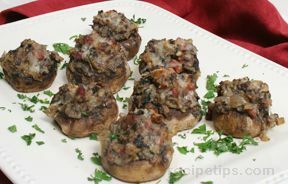 Bake the mushrooms 18-20 minutes, or until tender. 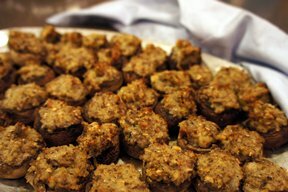 "Loved these mushrooms. Brought them New Year's Eve to a party and they were gone in no time."